What's Up, Doc? When Your Doctor Rushes Like The Road Runner : Shots - Health News When it comes to time, there is a stubborn feeling among patients that doctors are in too big of a hurry. That is troubling — and frustrating — to physicians who feel that they are already packing more into every workday and are stretched thin by paperwork. Patients continue to complain that physicians don't spend enough time examining and talking with them. To physician Larry Shore of My Health Medical Group in San Francisco, it's no surprise that patients give doctors low marks for time and attention. "There's some data to suggest that the average patient gets to speak for between 12 and 15 seconds before the physician interrupts them," Shore says. "And that makes you feel like the person is not listening." 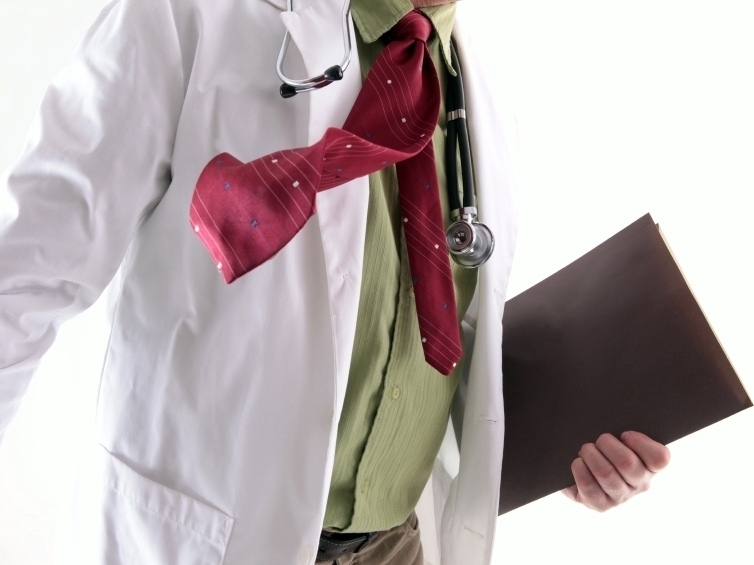 A doctor's impatience, though, is often driven more by economics than ego. Reimbursement rates for a primary care visit are notoriously low, and Shore laments the need to hustle patients in and out. "When you have that pressure to see three, four, maybe five patients an hour, you can't wait for the exposition of the patient's story. Which is exactly what you should do. But you can't," he says. A new poll by NPR, the Robert Wood Johnson Foundation and Harvard School of Public Health found about 3 out of 5 patients think their doctors are rushing through exams. That's nearly the exact same number as three decades ago. NPR's survey asked people the same questions as another poll did back in 1983. We found doctors got better marks on some patient interactions. For example, 64 percent of people said doctors usually explained things well to them, versus 49 percent in 1983. They also are more likely to say doctors are trying to hold down medical costs. But when it comes to time, there is a stubborn feeling that doctors are in too big of a hurry. That is troubling — and frustrating — to physicians like Shore who feel that they are already packing more into every workday and are stretched thin by paperwork. "I think a lot of physicians in smaller practice realized they were becoming both the clerk and the HR and the accounts payable and the accounts receivable and the office manager — things which they may not have an interest in and certainly had no training for," Shore says. But he says many doctors just didn't have the cash flow to hire administrative staff. Two months ago, Shore opened a new office in which he's trying to break from the day-to-day grind. Appointments are now 20 minutes, instead of 15. And he's hired several other doctors to spread the workload around. But there's also been a shift in his thinking about the way he provides care to his patients: He's trying to treat them more like customers, and focus on making them happy. "Who are your customers? What do they want? Try to meet those needs," Shore says. And what his customers want, he believes, is access to him and his staff — how they want it, like over email, and when they want it, like after-hours. To do that, Shore has given up on the model of the doctor as a lonely superhero. Instead, everything is about the team. Shore hunkers down each morning with his medical assistants for a "care huddle," a rare, quiet moment to strategize about the patients coming in that day. Those assistants now play a bigger role in care, renewing prescriptions and briefing the doctor before he enters the exam room. A check-out assistant guides "customers" out the door. Shore is trying to make up the financial difference of hiring these additional people by getting the office manager to badger insurance companies to pay more money per patient for better patient health. That doesn't include patients getting any test or treatment they demand. But Shore's younger colleague Payal Bhandari sounds as much a marketer as family physician when she talks about her hopes for a better assembly line. "It will actually produce a much better product, where you can actually listen to patients," Bhandari says. "And the physician is a lot happier because they don't feel like, 'Ugh! Another person!' They can actually do their job, but there are others helping them in the process." Will these improvements be enough to move the stubborn poll number? Shore is optimistic, a belief reflected in a fortune cookie message taped to his office window: It says: "Be not afraid of growing slowly. Be afraid only of standing still." Varney is a reporter with NPR member station KQED.